To give you a better understanding of the complexity of rhinoplasty surgery and the factors that need to be addressed by surgeons, we’ve provided a little more information on the structure and anatomy of the nose. The outside of the nose is divided into thirds. The upper third is a hard bony roof, formed by the nasal and cheek bones. The middle third is softer and made of cartilage. 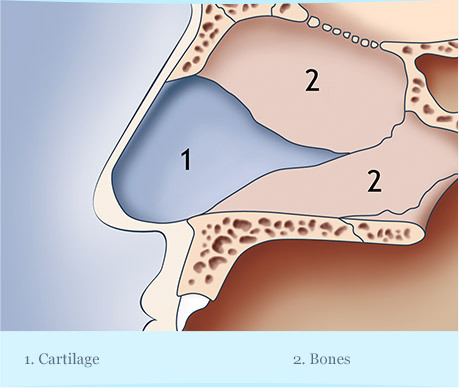 This cartilage is stiff down the middle of the bridge (the top of the nasal septum) and softer at the sides (the upper lateral cartilages). The lower third, or nasal tip, is made up of the right and left lower cartilages. These are thin and wing shaped, arching over the nostrils. The inside of the nose contains the nasal septum, which is a wall that sits in the middle of the nasal cavity separating the two sides of the nose. The septum is made of thin cartilage and bone and is covered by a mucous membrane. The front end of the septum can be easily felt behind the skin between the nostrils. The top edge is felt by running your finger along the bridge of the middle third of the nose. When performing surgery, it is important to think of the nose in aesthetic subunits from all views. 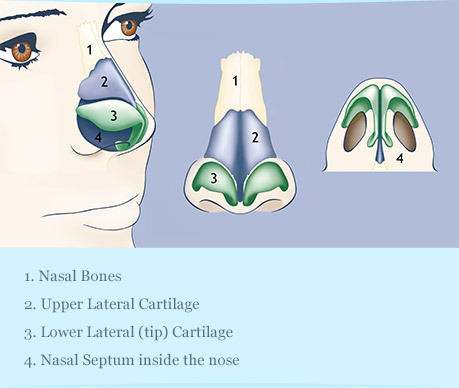 The surface of the nose can be measured and matched to the underlying bone and cartilage. The surgeon must then plan-and-map before performing a rhinoplasty procedure. This will help produce a functional nose of proportionate size, contour and appearance for the patient.